Whether you regularly include tests in your homeschool or never test your child, you need to learn about the standard high school tests to prepare your child for college. But what you may not know is … not only will they help your child get into college, but they can also be the key to saving money—through scholarships attached to these tests and even by earning college credit using tests! Understanding the common high school tests can save you real money right now—saving thousands of dollars on college costs. My son Noah got an okay score on his ACT exam. Not bad but not exceptional either. Yet it was enough to get him a $13,000 yearly scholarship to the school of his choice. He was also able to pursue a double major because he had taken CLEP and AP tests in history and science. That cleared up his schedule enough to allow him to pursue a double major and still graduate in 4 years! 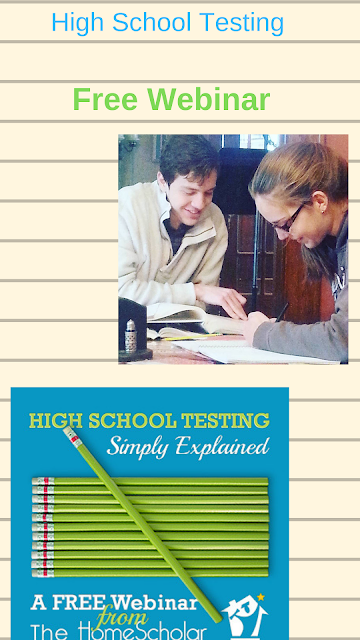 Although you may have taken one of these tests in high school yourself, you may not know how to register or prepare your child for these tests in your homeschool. So, how do you get all the information you need? Well here's a simple, informative and FREE way to do that next week! Sign up now to for Lee Binz's "High School Testing - Simply Explained." I have blogged many times about Lee and how her work helped me prepare my own kids for college and the work world. Her presentations are entertaining and chock full of information. In this free workshop, Lee Binz, will go in depth on the PSAT, SAT, and ACT to give you the understanding you need to ensure your child’s success. There are even two dates and times to choose from, to make it easier for you to attend live!